Yu Darvish dazzled in his Los Angeles debut. He struck out 10 Mets over 7 innings of 3 hit shutout ball and got the 6-0 decision. Justin Verlander pitched 7 innings, allowing 2 runs and striking out 10 Orioles to get the Tigers 5-2 win. Daniel Murphy got 3 hits including 2 homers, driving in 3 to help Washington top the Cubs, 4-2. Tyler White amassed 11 total bases including 2 homers over his 4 hits, driving in 5 and leading Houston to a 16-7 slugfest over Toronto. Jordan Zimmermann held the Yankees to 2 hits and no runs over seven strong innings and earned the 4-0 decision in Detroit. Brock Holt collected a pair of hits including a grand slam that sparked Boston’s 8-7 comeback win in Toronto. Jacob deGrom threw six solid innings, allowing 1 run and no walks as the Mets made quick work of the Phillies, 7-2. Starling Marte launched a go ahead grand slam and added two more hits as the Pirates came from behind in Cincinnati, 6-5. They all owned baseball on April 8, 2016. The American League has some young talent, however about only half of the guys on this list will even break camp with their parent big clubs,and others will be blocked for various reasons -including against each other on their own squads. There is really only one good bet and one bad for entire 15 guy list. 1st off the Twins have the top 3 players listed for the category in Buxton, Ho-Park and Berrios. All Minnesota youngsters could make the squad, although Buxton is posting just a .567 OPS in Spring Training – after only putting up a .576 OPS in his 129 AB for 2015. He will be given the starting job to either make it or not, after the trade of Aaron Hicks. Don’t like the favorite status for most of these categories, this will ring true one more time. Ho-Park has looked solid at the dish so far with a 3 Slash of .283/.306/.543 – with 3 HRs and 13 RBI in his 46 AB, and at 29 years of age – coming over from the KBO, he has years of experience next to his classmates. Jose Abreu and Ichiro Suzuki both came over as later in life rookies to the Junior Circuit and took the honors Ho-Park was a beast in Korea – blasting over 50+ HRs in each of the last 2 years there for his club team Nexen. While you have to temper expectations coming overseas to North America from there, what I love is that the guy improved his numbers in each of the last 5 years. This bodes well for him in Minny. With a 4 year deal in his back pocket, Park will and should remain on the big roster based on his early success. 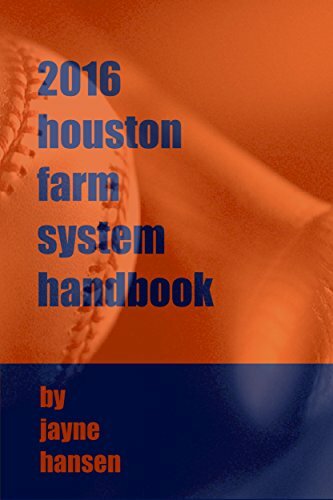 The 2016 Houston Farm System Handbook is now available for purchase and is already drawing great reviews! When I introduced the Houston Farm System Handbook in 2015, almost all of the reviews were of the 5-star variety (one person raved that they loved it but only gave it 4 stars). Astros Announcer Bill Brown complimented me on doing “a masterful job cataloging tons of information on the Astros prospects” and really liked the portability of an e-book. As good as that 2015 Handbook was, the 2016 version should prove to be even more valuable to prospect fans everywhere with the addition of a “Beyond the Top Prospects” depth chart. Before last season I was touting prospects such as Matt Duffy, Tyler White, Jon Kemmer and Albert Abreu, all of whom landed in Baseball America’s Prospect Handbook for the first time recently. In my depth charts, I have identified a number of players who may very well debut in that publication next year, including RHP Dean Deetz, 1B Chase McDonald and many others.